Before starting this module, all students in AML610 were asked to apply for an XSEDE user portal account by going to this link and filling in the form, and choosing a username. Note that your TACC password is not necessarily the same as your XSEDE user portal password. If you can’t login, go to the TACC portal webpage, and ask to reset your password. 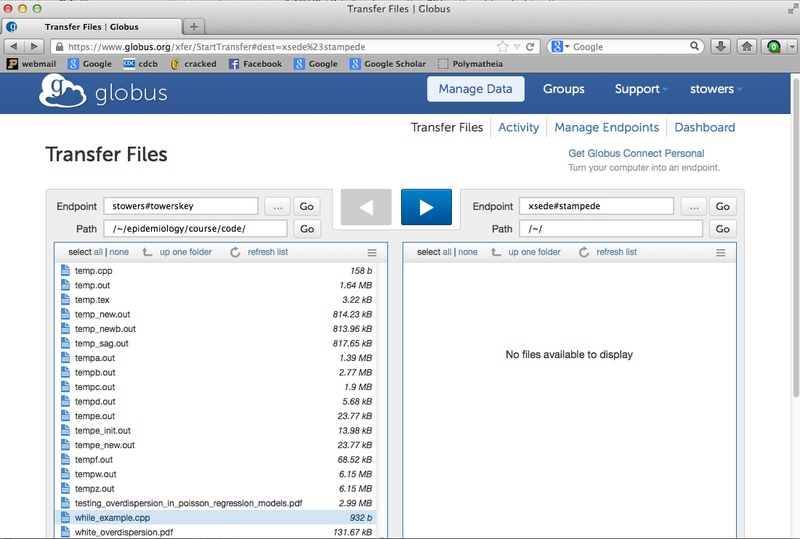 However, while using scp is possible to and from XSEDE resources, XSEDE prefers instead that you use the Globus application they have developed, rather than scp, because Globus is designed to be more efficient for the transfer of large files. You need to set up the Globus application before you can use it: go to the page www.globus.org/globus-connect-personal and select the operating system for your laptop/desktop. 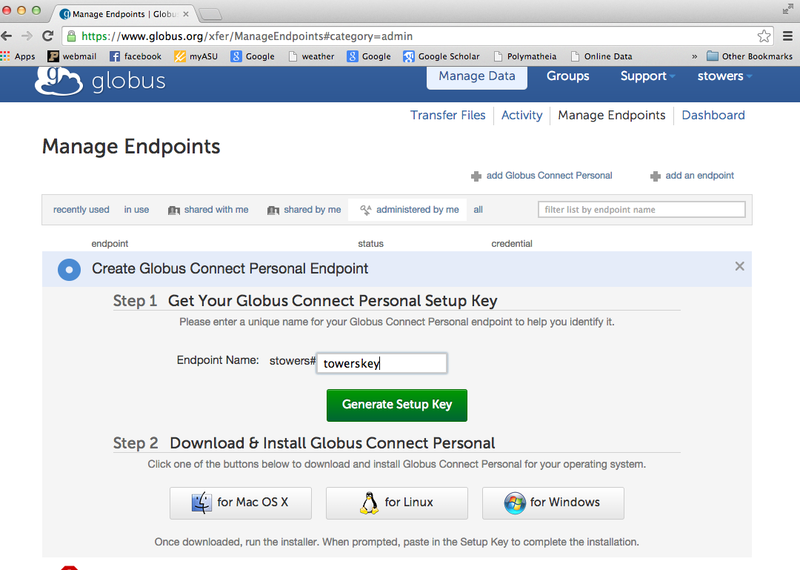 Click on your operating system under “Downloads” and follow the step-by-step instructions to set up a Globus user account (“Sign Up with Globus” at https://www.globus.org/SignIn#noauthfor=%2Fxfer%2FManageEndpoints). You can name your key whatever you like, but remember what you called it for future reference when transferring files (write it down somewhere). Once you enter your key name and click “Generate Setup Key”, it will give you a Setup Key that you need to copy. Now download and install Globus for the operating system of your choice by clicking on the appropriate link on that page. Now run the Globus application on your laptop, and paste in the Setup Key that you had copied earlier. So far in this course on our laptops we’ve been using the gcc or g++ compilers to compile our C++ programs. For Stampede, there is a special compiler that they want you to use for C++ compilers called icpc. This involves just a simple change to your makefiles, where you substitute in icpc for g++. Note that I could run the while_example program from the command line on Stampede, but that is not what Stampede is meant for (so don’t do it, because you’ll get your account suspended!). Stampede is meant to be used as a distributed computing system, where you can execute many copies of the same program on several different processors at the same time. Stampede is directed to do this via what is known as a batch submission script. Some background: What is a batch job? A batch job is a computer program or set of programs processed in batch mode. This means that a sequence of commands to be executed by the operating system is listed in a file (often called a batch file, command file, or shell script) and submitted for execution as a single unit. The opposite of a batch job is interactive processing, in which a user enters individual commands to be processed immediately. In many cases, batch jobs accumulate during working hours, and are then executed during the evening or another time the computer is idle. This is often the best way to run programs that place heavy demands on the computer. On high-performance compute clusters, users typically submit batch jobs to queues, which are classes of compute nodes, managed by a resource manager, such as LoadLeveler and TORQUE (also known as Portable Batch System). Frequently, clusters employ separate job schedulers, such as Moab, to dispatch batch jobs based on the availability of compute resources, job requirements specified by users, and usage policies set by cluster administrators. To see which resource managers and job schedulers are used on various Extreme Science and Engineering Discovery Environment (XSEDE) clusters, seeOn XSEDE compute systems, what applications are used for scheduling jobs? In the next module, we’ll discuss how to run an example job in batch on XSEDE. This entry was posted in ASU AML610 Fall 2014, R by Sherry Towers. Bookmark the permalink.